They’re on your Facebook feed, your Instagram wall, and they also come up in search engine results. As a former TV journalist, I know that video is a powerful way to reach people — and being on camera regularly solidifies your connection with your audience. I had the pleasure (sarcasm intended) of sharing three pregnancies while on TV over the course of six years. To this day, people come up to me to tell me they, too, remember the journey. While I don’t like to think about how much weight I gained, I’m still amazed by the impression those pregnancies made. My youngest child is nine years old! Are you ready to up your content game with videos? This guide will share five steps to help you get started and become confident on camera. I won’t sugarcoat it. Creating videos can be frustrating. There is a learning curve and you may not be pleased with your results at first. You will record something, look at it, and then make the mistake of comparing your video to what other people are creating on YouTube. What you have to remember is those same people — the ones with millions of followers today — had to start at zero, too. In March, I ran a Video Bootcamp for entrepreneurs and creatives. They all understood the power of using video to spread their messages. But they didn’t know what to say, what to wear, and what type of equipment to use. By simply signing up for the Video Bootcamp, they made learning a priority. The students who continued making videos after the session tell me their videos are growing their email lists, creating connections, and producing sales. They made the commitment to start, and it’s paying off. Having the right type of equipment used to be a big problem. In my first TV job many years ago, I remember carrying a 50-pound camera on shoots and then having to go back to get a 25-pound tripod. Start with what you have. Much like creating a minimum viable product, your video process begins by creating videos as simply as possible. Work your way up as you get more comfortable and you see the response your videos get. Here’s a brief outline of The Big Three: equipment, lighting, and sound. Video equipment doesn’t have to be intimidating. Use the camera sitting right next to you — the smartphone, the laptop, or the point and shoot camera that has a video feature. There are entire industries devoted to cameras, lights, and microphones, and you can definitely invest in more expensive equipment. But, the purpose of this guide is to help you get started using video.. It really doesn’t have to cost a lot. Good lighting makes you look like a million bucks. But you don’t have to spend anywhere close to that. I am a big fan of using natural light. The best in the business do. If you shoot videos indoors, sit by a window where the light hits you from the front or from the side. Make sure the light isn’t behind you because it will wash you out. Sound quality is every bit as important as your video quality. It makes sense. If people can’t clearly hear what you are saying, your content won’t be as engaging as it could be. Record your videos in a quiet space. High ceilings or ceramic tile floors increase the chances of an echo, so look for smaller spaces that have carpeted floors. Your closet could even work to produce good sound. If noise is still an issue, invest in a microphone. You can plug it into your phone or get a USB connection that runs to your laptop. In your videos, just as in the copy you write, it’s important to address the person you want to reach, whether it’s a tween boy or an adult gardening enthusiast. A tween boy is likely going to be interested in Minecraft videos, while an adult gardening enthusiast would prefer a tutorial on how to grow basil. Your topics and goals are going to be different depending on your audience. Are you trying to reach the owner of a technology company, the buyer of a retail chain, or a stay-at-home mom? Focus on sharing something that person is struggling with, followed by a solution you offer … then highlight the transformation that occurs. While you may be nervous, it’s important to remember the video is not about you. The audience is more focused on learning a solution to their problem than what you’re wearing. Really. Videos help you create connections because you’re able to share your personality. You don’t need to fit a mold to be successful on camera. You don’t have to be anybody but yourself. In this day and age, when Facebook and Instagram feeds are filled with videos sharing all kinds of messages, the only thing that makes you different is you. Before you get your voice out there, though, it is important to practice. I know that sounds counterintuitive, but I have seen too many people who don’t sound like themselves on camera because they are so nervous. Over a TV career that has spanned twenty years, I have had the pleasure of interviewing thousands of people — everyday folks, celebrities, entrepreneurs. And most people are just not comfortable on camera. In order to get better, you need to do what I call, “practice for real.” It means practicing in an environment where the result is final. Create a small Facebook group and go live inside there, among your friends and family. Or put together a video that is “live to tape,” meaning even though the video is not broadcast live, it’s the final version no matter what is on that recording. By putting yourself in situations that force your brain to say, “This is the real deal. I have to be ‘on,’” you will be mentally ready to rock your video. Send the video you create to your best friend, no matter what. Put constraints on your time. Instead of telling yourself you have two hours to create your video, give yourself 10 minutes. Even better, schedule a meeting and try to get the recording done before you have to leave the house. The video will get done. People often get discouraged by how much work goes into the process of making a video. Sometimes it means they don’t even get to the starting line. For others, it means they peter out after a strong start. But remember this: If you are sharing information you know serves your audience, if your intentions are true, if you create a message with impact, then you have nothing to worry about. And it’s a disservice to keep your message to yourself. Just the other day, I ran into a client who I encouraged to start using video to share her message. By creating videos that showcase her thought leadership, her business is thriving because her company now has a higher caliber of job applicants. She’s thrilled. And now she’s a believer in the power of video, too. She just needed someone to tell her to get moving. I will share with you what I told her: I give you permission to start creating videos. I can’t wait to see the results! I have been contemplating if I should give video a try to grow my inbound marketing agency for over a year. And this article has helped to realize that I will be fine by being myself and giving it a try. Thanks. Yes, Derrick! Definitely give it a try. Take it step by step and start creating. Good luck! Please let me know if you have any more questions about the process. Thanks for this post, Cheryl! I’ve been blogging for about 5 years now. I’ve been doing videos for a few weeks now for a volunteer team that I manage (around 160 people) every week. I took a couple of months to practice, making a video daily, for myself, before finally sharing with others… Certainly learned a lot just by re-watching myself. Thanks for your wisdom today! Love this, Alex! How do you feel about creating videos now? The biggest difficulty in creating videos, in my opinion, is just to start them, after a good start, you capture the attention of the public because I believe that the first 30 seconds of a video is very decisive for the public to be interested or not in seeing what I have to offer. Yes, I totally agree, Matheus. The beginning is the most difficult part. My take on the first part of the video is this: get to the point quickly. Tell the viewers what you’ll be telling them, tell them and then tell them what you told them. If you share your videos with the right audience and you follow that, you shouldn’t have a problem. How often do you create videos? Lots of great tips here! The quote in the first image really struck home. So many people want to use videos in their content marketing but they feel like they have to be perfect. Newsflash: people can’t relate to perfect! If you want to really connect the secret is to be yourself. That authenticity (hiccups, mistakes and all) will draw people in that “click” with you. Thanks so much, Daundra! A million times, yes! How do you use videos for your work? My first video is bad. It is 240 p and I can’t see my face clearly. I wrote on a paper and shot it. I used the basic terrace setting and it got hate comments. But I kept on making videos and I get less hate comments. The key is to start and keep on improving bit by bit. Slowly you will find your rhythm and your level would go up. Hey, Cheryl!! Thanks for sharing this insightful article! Thanks so much, Krishi! Are you creating videos already? I would like to do a video about my occupation as a licensed private investigator and my business, J. Edgar Investigation Agency. I have a Sony Handycam and a Logitech Web Cam. Which one should I use? I love that you have decided to move forward with creating videos, John. Either one is fine. Because you have two good pieces of equipment (and don’t forget your smartphone), you have a lot of options. The HandyCam will allow you to take your viewers behind the scenes. Maybe you can use it show how you get answers from your sources or how you track down people through unusual means (guessing here!) 🙂 The webcam will be for when you’re at your computer and want to be a “talking head,” the expert sharing some tips or tricks of your trade. Lovely post, i really needed this. I am a budding movie blogger and publishing movie review, weekly round up for movie (Nollywood) news in videos is in my plans. I plan on kicking off after a year as a blogger and this has killed some of my fears and boost my morale. Okechukwu, you can do this! Excited to hear about your video journey. Keep us posted! Interesting read, post production edit work is the most essential of all listed above. But again this is another ball game or different topic. Smart phones have made things much easy for beginners or for those who don’t want to mess with dslrs. Thanks, DP! There is SO MUCH to cover when talking about audio, equipment, lighting and post-production. But the clients I talk with first need a push to get started. I tell them they have to start somewhere. Do you create videos already? Do you compose the text before filming or you go directly on the camera and record the video? You can do this, Alex! There are MANY ways to create videos. The best method is the one you enjoy enough to stick with and make better. For someone new to this, I would suggest writing out a script, or at least putting together a brief outline. You want your video to have a clear, beginning, middle and end. And you must get to the point quickly. So, tell your viewers you’ll be reviewing this metal detector, give your three key points about it, recap your points and then tell them to go to your blog or landing page for more information. Take this script and get in front of the camera. Turn on the camera and start recording, with you facing the camera and using your script. If you look down, look down. Once you get your thoughts together, look back up at the camera. Do this a few times and you’ll have memorized large chunks before you know it. Over time, this process gets MUCH easier. But you have to get started first. I hope this helps! 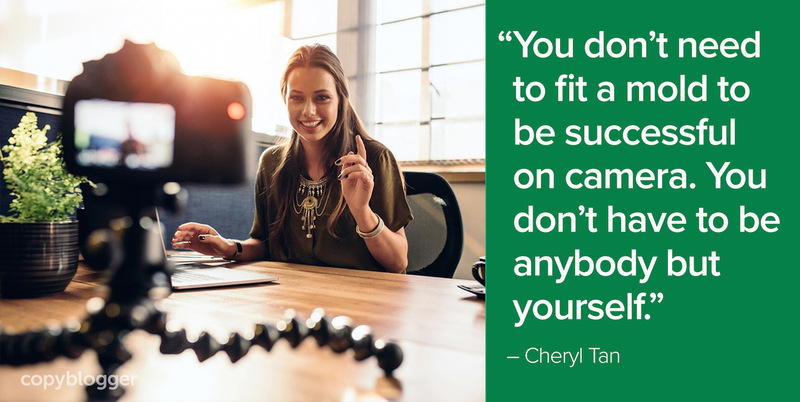 I love this sentiment Cheryl: “But remember this: If you are sharing information you know serves your audience, if your intentions are true, if you create a message with impact, then you have nothing to worry about. And it’s a disservice to keep your message to yourself.” If for nothing else, this may be the reason I make myself make videos. Thank you!